There are a million reasons to bring rocks home from the beach. And I’ve used about 999 of them. I’ve been carrying rocks around since I was a child; no matter where I went, I found a rock I simply had to have, and filled shoes, pockets, suitcases….No surprise, then, that I would end up on the coast of Rhode Island where the beaches are a combination of stone and sand. As I was saying, my excuse. This year, it is the drip edge. My house doesn’t have gutters, so the rain washes off the roof in sheets (as it only rains in sheets these days, have you noticed?) and makes dents in the plants below. 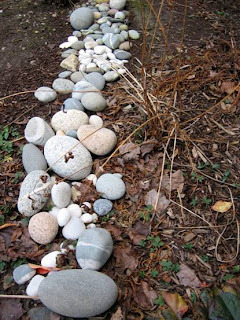 Now the rocks will catch the blunt force of the water, and as a side benefit, they are washed and clean by the time winter comes around, and give me something besides mulch to look at in the winter. We also travel home from our trips with rocks. We even brought some back from Ireland!